Clostridium difficile, called “C. diff,” is a spore-forming bacterium that is emerging as a leading cause of potentially deadly health care-associated infections. Toxins from C. diff cause gastrointestinal disease, with symptoms ranging from mild diarrhea to life-threatening colitis, often including dehydration and abdominal pain. In the United States, 350,000 people are hospitalized every year due to C. diff infection, and 77 percent of the cases occur in people age 50 or older. 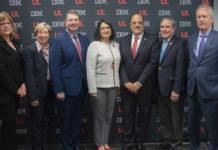 The Phase III Cdiffense trial at UofL is led by Julio Ramirez and Ruth Carrico the medical and clinical directors of the Vaccine and International Travel Center in the Department of Medicine’s Division of Infectious Diseases. UofL is one of 200 trial sites in the United States and 16 other countries participating in the randomized, observer-blind, placebo-controlled study. For additional information about the study and enrolling in the trial, call 502-562-2822 or visit the National Institutes of Health clinical trials website at ClinicalTrials.gov, using the trial identifier number, NCT01887912. “While most health care-associated infections are declining, C. diff continues to cause life-threatening infections seen in hospitals and long-term facilities worldwide, raising concerns about how to control it and prevent transmission,” Carrico said. The trial is sponsored by Sanofi Pasteur, the vaccines division of Sanofi (NYSE: SNY). In 2010, the FDA granted fast-track designation to the investigational C. diff vaccine being developed by Sanofi Pasteur. The fast-track program of the FDA facilitates development and expedites review of new drugs and vaccines that are intended to treat or prevent serious or life-threatening conditions and demonstrate the potential to address unmet medical needs.